Brought to you by an established Lower Mainland builder and offering affordable New West condos for sale in an enviable location along the waterfront, the new Northbank New Westminster high-rise residences are now launching to the general public. Condominium buyers looking for the best Lower Mainland real estate value need not look anywhere else. 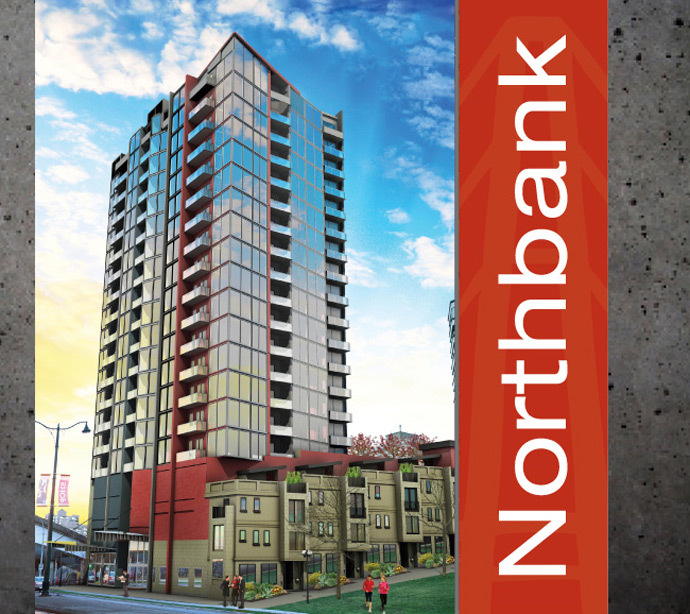 The opening of the new Northbank New Westminster condo sales program features some of the best high-rise condominium value in the entire city. And if you are looking for endless views in all directions, the New Westminster Northbank condos will offer you just that. Not only that, due to the proximity to the river as well as it’s ideal project locale, the Northbank New West condo building will offer water views forever. VIP previews are now available, so please sign-up on our blog for more information. Our dedicated realtors will assist you in finding a New West Northbank condo that fits all of your requirements, including specific floor plans, views and pricing. One of the best features of these water view New West condos for sale at the Northbank condo tower includes the pre-sale pricing which starts from just the $260k range, making them very affordable for today’s homebuyers and at today’s low mortgage rates. Some of the pricing is very comparable to the recent sell-out at 258 New Westminster (actually, it sold out opening weekend), which makes the affordable Northbank New Westminster condo tower even more significant as these residences have great three hundred and sixty degree views out towards the mountains and to the water. More information is online at www.northbank.ca. The offering includes 109 concrete high-rise residences launching right now at the waterfront New Westminster real estate market. Here are some of the incredible features at the Northbank New West condo tower by Ballenas that represent great value for the offering. The kitchens at the Northbank New West condos for sale will have recessed pot lights, heavy duty galvanized steel in sink garburator, Kohler ‘Simplice’ one piece pull chrome faucet with vegetable spray, high-end Cosentino Silestone quartz stone counters, breakfast bars, sleek, contemporary laminate cabinetry with full upper cabinets and soft closing mechanisms. The new Northbank New West condos for sale will also include under cabinetry puck lights, full height ceramic tiled backsplashes, under sink roll out recycle/garbage bins, additional base cabinets from the dining area and lots of pantry storage with four roll out drawers. The high end features at the New West Northbank condos for sale will extend to the living room where you will find professionally designed colour schemes (2 to choose from) in addition to twenty six ounce stain resistance textured loop carpets in all becrooms and Euro style wide plank laminate wood floors in the living room by Kraus. The bathrooms at the New West Northbank condos for sale will include Cosentino Eco composite counters, white/high-gloss laminate vanities, Acri-tec undermounted basins in rectangular designs and Hystar bathtub. Also featured in the bathrooms at the New Westminster Northbank condos for sale include Kohler finishes (both the chrome faucets and Sterling toilet with soft closing mechanism for the seat and with an elongated bowl for added comfort). The New Westminster Northbank condos for sale will also feature bathrooms with large format porcelain tiled floors, Kohler Singulier chrome bath and shower trim kit and large format ceramic tiled tub surrounds. Back to the kitchens in the preconstruction Northbank New Westminster condos for sale where home buyers will find a Broan Slimline 300 cfm hood fan, built in stainless steel Panasonic microwave oven, KitchenAid dish washer and stainless steel interior as well as a KitchenAid self cleaning thirty inch glass top convection and range oven. Also, the new Northbank New Westminster condos for sale will include a Samsung counter depth French door fridge with ice maker. All homes at the Northbank New Westminster condo tower will come with Whirlpool duet full sized front loading washer and dryer that are energy and water efficient too. New Westminster Northbank Water View Condos for Sale! Launching February 2012, the new water view condos at Northbank New Westminster real estate development is brought to you by Ballenas Project Management, an established builder with more than 2 decades of proven experience in multi-family housing in addition to MAC Marketing Solutions. 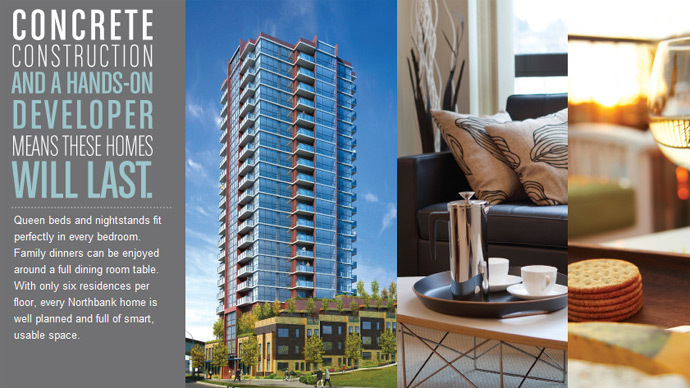 With pre-sales starting from just the $260’s, this is the best opportunity for New Westminster condos this year! There are only one hundred and nine concrete high-rise Northbank New West condos for sale with the presentation centre opening at 18 Begbie Street New Westminster (at the corner of Columbia and Begbie) across the way from the Waves Coffee. Another great advantage to purchasing a New West Northbank condo is that they developer will be offering a 10% deposit on the purchase price, which is a limited time opportunity and will allow you to save up for your down payment upon completion. Here is the panoramic views that you can enjoy from these New Westminster view residences at The Northbank Tower. The project is expected to be completed by mid 2014 and the site location of the Northbank Condominiums is at 125 Columbia Street New Westminster BC. The ceiling heights of the homes is expected to be around the 8.5 foot range, which is considered over height and the floor plans at the Northbank New West condos for sale are expected to be between six hundred and twenty five (625 sf) to nine hundred and twenty three (923 sf). Of course, there are approximate sizes and subject to change at any time. The draft layouts have yet to be released. The 109 suites at the New Westminster Northbank water views condos will be situated within a 16 storey high-rise tower which will have a great curb appeal and will be designed with glass, steel and concrete for a striking façade. The homes will overlook Albert Crescent Park as well as the Fraser River and the functional layouts will feel much larger than they are because of the great design. With the purchase price of the new Northbank New Westminster condos comes a parking stall included as well. Again, the project is brought to the market by Ballenas Project Management and offers stunning views, well thought out home plans and a level of attention to detail that only this builder can provide.